The Fourteenth Judicial District Commission on Judicial Performance unanimously (9-0) voted that Chief Judge Michael A. O’Hara, III MEETS PERFORMANCE STANDARDS. Background: Judge O'Hara was born and raised in California. He received his undergraduate degree from St. Mary's Seminary in Missouri, and his law degree from the University of San Diego in 1984. After law school, Judge O’Hara joined a litigation firm in San Diego where he practiced for approximately seven years. In 1991, Judge O’Hara moved his family to Steamboat Springs, practicing eleven years with the same firm, where he ultimately served as managing partner. His litigation practice emphasized family law, personal injury, and criminal defense. 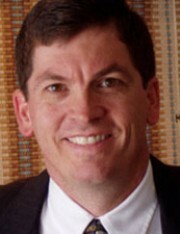 He was awarded the Northwest Colorado Bar Association Professionalism Award in 1999. In 2003, Judge O’Hara was appointed to serve as a District Judge for the Fourteenth Judicial District, covering Moffat, Routt, and Grand Counties. In 2016 Judge O’Hara received the Judicial Excellence Award from the Colorado Judicial Institute. Judge O’Hara is the Chief Judge for the District and is the Water Judge for Division 6. Performance: Judge O’Hara maintains a full and diverse case load that includes criminal, domestic relations, civil, juvenile, probate, and water cases, and is required to travel between the courthouses in Steamboat Springs and Craig to manage his docket. As Chief Judge for the district, he effectively manages court staff in three counties. He is also very involved in the betterment of the judicial system through his volunteer work on multiple commissions. It is apparent that Judge O’Hara cares deeply for the people who appear in his court and for the well-being of the legal system as a whole. Judge O’Hara issues well-reasoned decisions and explains his verbal and written rulings thoroughly. He is well-suited temperamentally for the job. The Commission discussed concerns with Judge O’Hara regarding taking on too much which has affected, among other things, timeliness of written orders. He also self-identifies this as an area needing improvement and has already started to implement solutions to address these concerns.